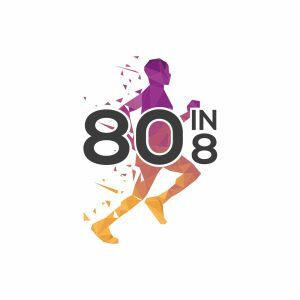 80in8 is a challenge I have set to run 80 half marathons in eight months. My personal experience with dementia began eight years ago when my Grandma Mary was diagnosed with Alzheimer’s, the most common form of dementia. She is an incredibly strong woman and is still fighting the disease with courage and bravery. Although my experience with dementia is very personal, I know that there are a million more stories to tell – some similar, some different – and I hope to hear and share them on this journey. Dementia is society’s biggest health threat, with over one million sufferers in the UK and 50 million worldwide, yet it remains in the shadows and is vastly underfunded. Dementia Revolution is the joint force of Alzheimer’s Society and Alzheimer’s Research UK and is Charity of the Year for the 2019 Virgin Money London Marathon. They have kindly offered to support the campaign and secure my place at the London Marathon in April. I hope to make this challenge collaborative and I want to run alongside people who have had personal experience of dementia, felt the impact of running on mental health, or anybody who just wants to get involved. You can join me for a full half marathon distance (13.1mi/21.1km – no pace too slow), or a section of a route, so please get in touch. I will be blogging about our journey and will complete the runs in a combination of personal and partnered distances, both informally and at formal events throughout the eight months. Progress will be updated on 80in8.com, the Facebook Page, Twitter, and on Virgin Money Giving. I hope that this challenge will help to spread awareness of dementia, as well as raise some much-needed funds for dementia research. You can see where the money raised will go here. I took up running in early 2017 and ran my first half marathon in May 2017. I then completed my first marathon in September 2017. During the time since I started running, I have regularly trained 50+ km per week, but this has for large periods given way to travel and other endeavours. Therefore, it shouldn’t be underestimated that this is going to be a huge challenge for me. I am by no means a “super speedy” runner who has trained for years, but somebody who loves running and recognises the positive impact it has on my physical and mental health. There is no set schedule for this challenge, and I hope that the journey will be influenced by as many of you as possible. This is as much your journey as mine, so please do get in touch. I hope to meet as many of you en route as possible and be sure to follow the journey on the website and social media channels! If you are a company who would be interested in sponsoring the challenge, an event organiser, or a media representative, please get in touch.